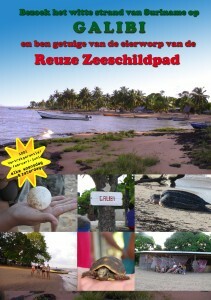 Tour naar Galibi, www.galibi-suriname.com en bezoek de zeeschildpad. Booking of this tour can be online at www.galibi-suriname.com or at one of our sales locations! The Galibi nature reserve is on the northeast coast of Suriname and has an area of ​​4000. Ha. Galibi is among the major egg laying beaches for sea turtles in the western Atlantic region. These egg laying beaches are known for the large populations of leatherback turtles. The name Galibi is a collective name for two Indian villages, and Langmankondre and Christiaankondre . We start from Paramaribo with a van and head to the east of Suriname. We stop at the border town Albina where we take a canoe on the Maroni River to the beach of Galibi. Arriving in Galibi we will take a refreshing swim or simply relax in the hammocks. Around 20.00 we depart towards the nesting of turtles. Here we go on turtle hunt. Here you will see live, how the turtles lay their eggs. This is a unique experience you will always remember. The second day you get a tour of the Indian village. Also visit the local zoo: Zoo Galibi. It is also possible to visit French Guiana a neighbor of Suriname.